Tillandsia, AKA air plants, are so much fun. 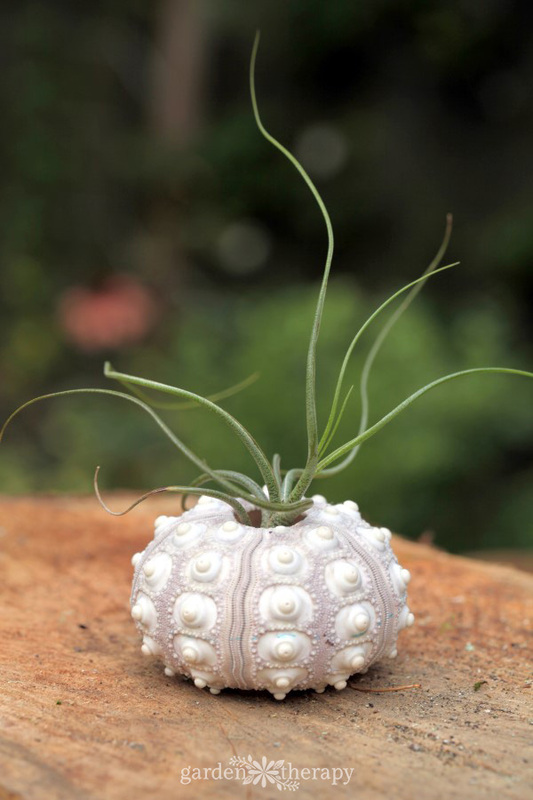 Their spiky tendrils are oh-so-cool looking and because they don’t need soil to survive, there are endless creative ways to display them, from terrariums to popping them inside seashells. You can even make them into jewelry! 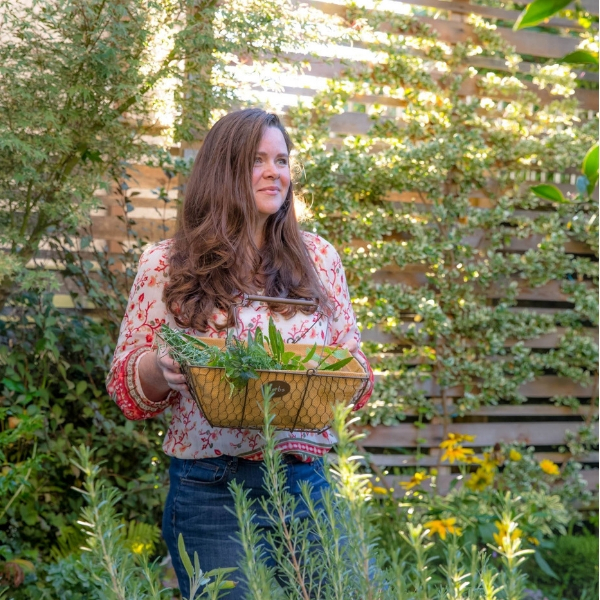 They are hardy and easy to care for if you know what to do, and the most common problems that people have with air plants are due to incorrect watering. Follow these steps to water air plants the right way and keep them hydrated and happy all year long. 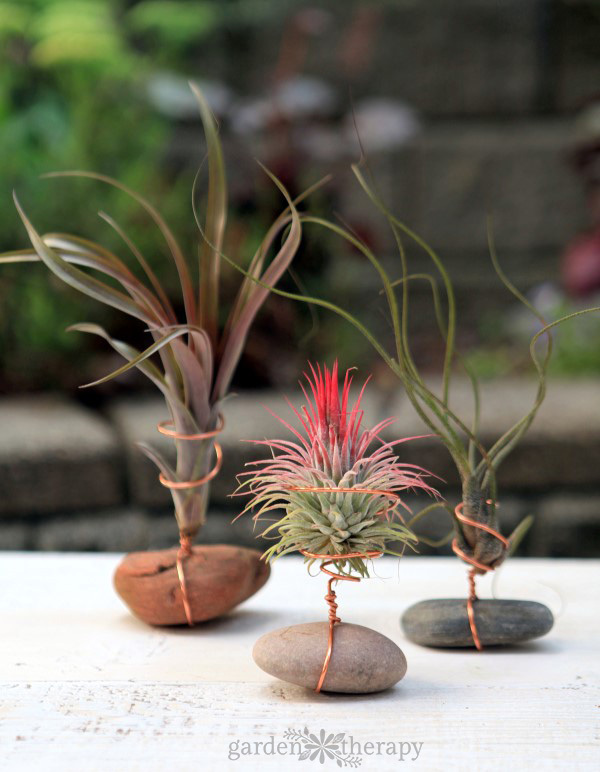 Air plants are called that because they grow without soil, in the air. 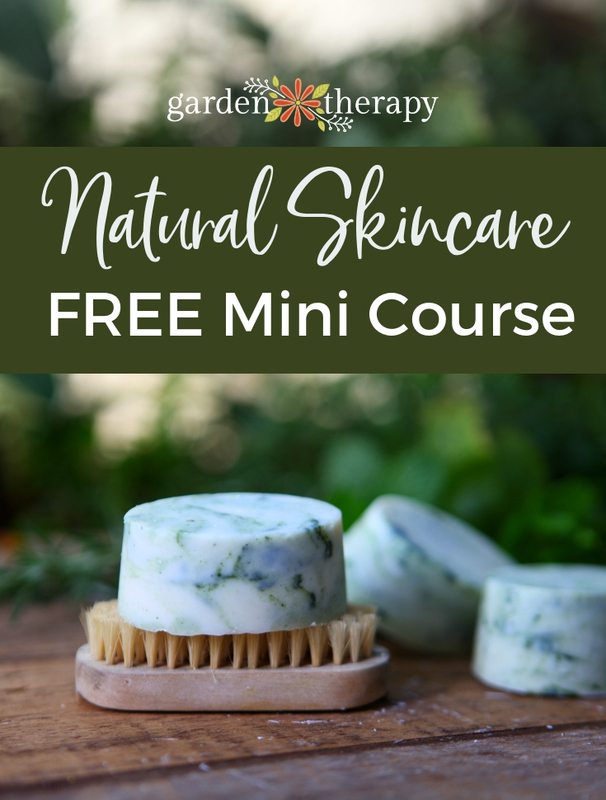 This means that they need to absorb moisture through their leaves and they need consistent moisture, either from very high humidity (as in a greenhouse) or from regular soaking. Often when you buy Tillandsia at the store, the label recommends spritzing them with water from a misting bottle a few times each week. We wouldn’t recommend this, though, as spritzing is just too inconsistent and doesn’t provide the air plant with enough moisture. When Tillys grow in the wild, they absorb moisture from the air which is much more humid than it is indoors, and that is usually where we keep them, so we have to soak them to rehydrate. That being said, greenhouses and garden centers just mist them, because it is already humid inside a greenhouse. And if you live in a humid climate (or a greenhouse) you can also get away with spritzing them. 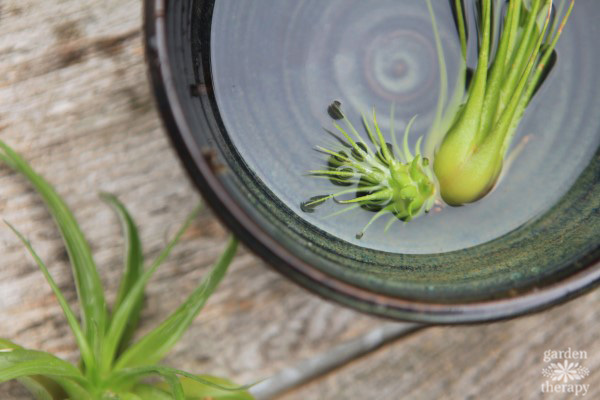 For air plants adopted as houseplants for the rest of us, the key is soaking them in a bath. 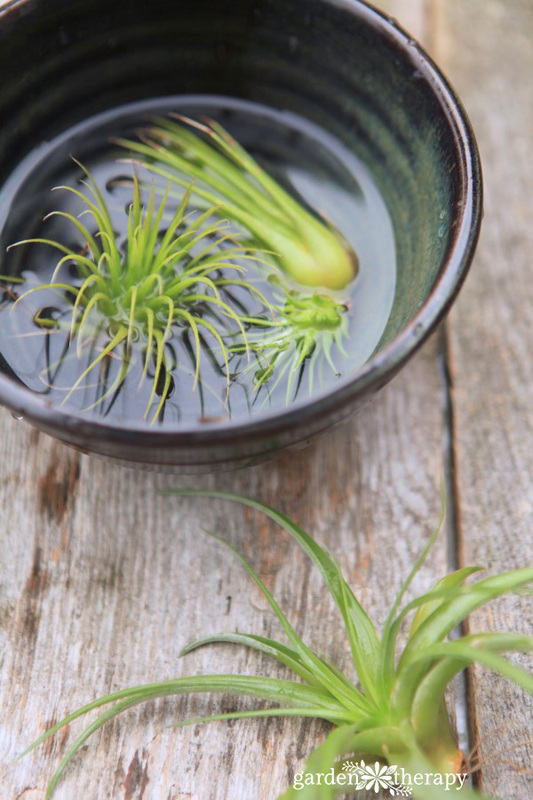 To water air plants, remove them from wherever you have them displayed and submerge in a bowl or sink full of enough water to completely cover them. Parts of the plants will float up above the water—this is okay, just make sure that the majority of each air plant is submerged in the water. Leave them in the bath for one hour. Remove each plant, hold facing upside down, and shake well to get rid of any excess water that may be pooling at the base of the inner leaves. Return your air plants to their regular spot until it is time to bathe them again. Don’t use chlorinated water for your air plants as it can harm them. Instead, use rainwater or filtered water if possible. If you want to use tap water, allow it to sit out in a bowl for 24 hours first so that the chlorine evaporates. Chlorine can turn the tips of the leaves brown. 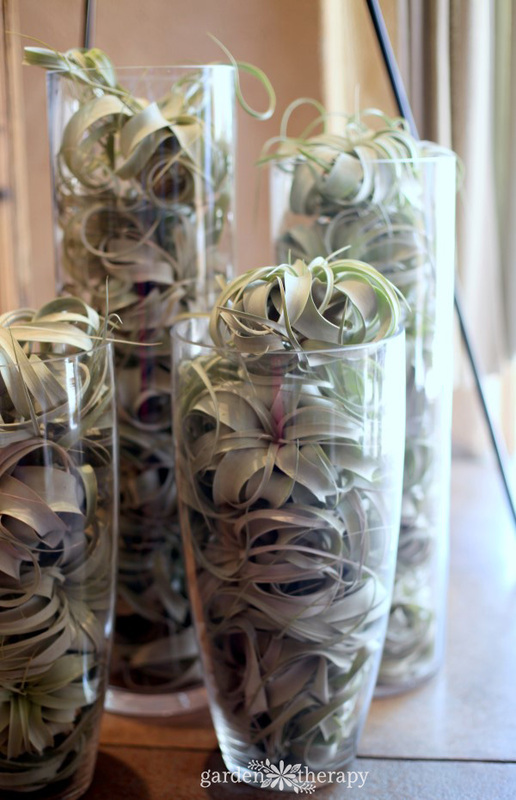 Depending on the season, air plants need to be bathed at different frequencies. In the summer when it is hot, they like to be bathed once a week, but in the cool winter months, once every three weeks or so will do. Pay attention to the changing of the seasons and the health of your air plant and water accordingly. Hi. I’ve got some air plants for Christmas. They really are great but I am new to all this and would like to see them do well. I am using rain water to soak them. The problem is that I only have a small deposit to collect rain water and I would like to re-use it for as many soaks as possible. I use a bucket with water from the deposit to soak the plants. For how many days or weeks can I use the water in the bucket? Will the plants use up the nutrients in the water after repeated soaking? I only have 6 little plants and the bucket is 3 liters. Thanks for your help. Tomas. I also use rainwater and can reuse it a few times before it evaporates or grows things. I really can’t say how long it is good for, as I live in a rainforest and have access to a lot of rain. How do I know if it’s dead? An why do retail places glue them to shells and other items? Silly question but how do I water it if it’s glued to the item. If it is dead all the leaves will fall off or it will turn dry, brown, and crunchy. Where Is the best place to keep an airplant? I keep them In my living room now on my coffee table under a lamp during the day till I go to sleep am I taking care of them correctly? Oh! I just got a bigger airplant that I keep In my bedroom window. Is that a good spot? ?